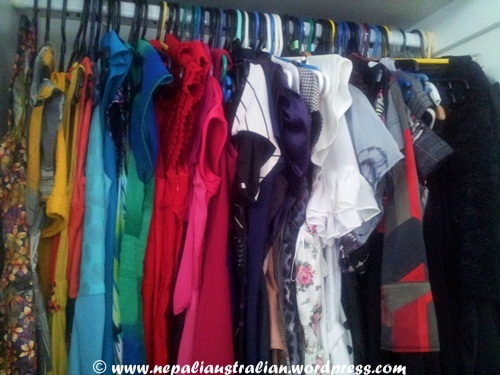 My husband has been reminding me for many days to clean my wardrobe. He did his a few weeks ago but his was easy. He threw away few unwanted t-shirts and jeans and was all done. I was not looking forward to doing mine as I knew it would take me forever. 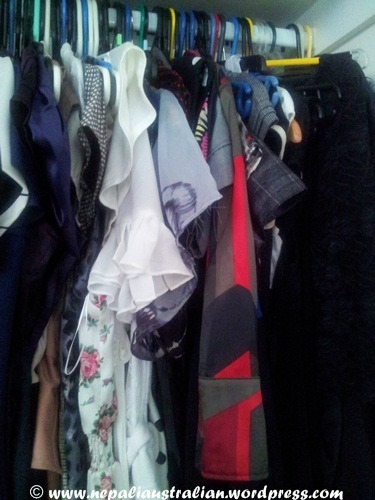 I think it had been more that 6 months that I had not rearranged my wardrobe. 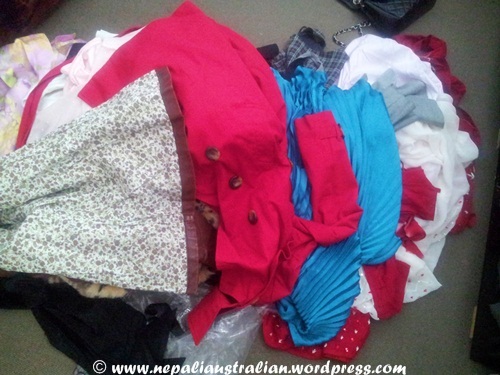 The clothes just kept on increasing with every new purchase. I promised myself that I was not going to buy any new shoes until I go overseas and I have kept my word. From Europe trip till now, I have bought just one pair of shoes (only because it was the kind I was looking for and it was on a big sale) and it is a record for me but I couldn’t commit to the promise in the apparel department. Every season there are new things coming in the market and it is hard to walk past the shops without trying something on. So it begins. I love some of the things I try and I will buy. I always justify with the thought that it is a good time to buy as they are cheap or they are on sale. May be this is what they call shopping addiction. I watched a movie a while ago called ‘Confessions of a Shopaholic’. It is a movie about a girl, Rebecca Bloomwood, who is a lovely redheaded young woman who loooooves to shop. I am not talking about the reasonable kind of love where she goes monthly or even weekly to see what’s new at her local boutique. I am talking about an addiction as powerful as any drug out there. When she walks past a store, the mannequins talk to her and convince her that this, only this, particular item has the power to make her feel better, more attractive, more alive. She shops using 12 credit cards, including her Gold Card, which is encased in a block of ice in the freezer in case of emergencies. While watching the movie I was glad that I wasn’t that girl in the movie who would ask money from strangers to shop. I know the movie shows the extremes of a shopaholic. I definitely will never be that bad but I am not very good either. Before I was married and even before my husband move to Australia, my favourite pass time was shopping. I used to work in the city and almost every lunch break, I with a few other co-workers would tour the closest shopping centres and look around for good deals. We did find some great deals and we used to spend lots of money. If someone was on a shopping trip and found some good deals, we used to text the rest of the girls and we would go running to the shop. We will go and try dresses and just buy whatever we liked and we were happy doing it. When you are surrounded by many people like you, you forget that you are a shopaholic as everyone around is doing the same thing. I have changed a lot since I changed jobs and my bank account is happier than before. There are no shopping centres close to my current work which means no shopping during lunch hours. So I have to plan to go shopping during weekends and we don’t do that every weekend. But every time we do, I always end up buying something. I really need to learn how to stop myself from going crazy about new clothes and shoes. After my husband came into my life, he did help me a lot to control my habit but I think there is still lot of work. Anyway, last week when I had a day off, I finally managed to clean my wardrobe. It looks much better now. I had a pile that I am giving to charity, a pile that I am taking to Nepal for my cousins and then a pile that I am packing in a box for winter. 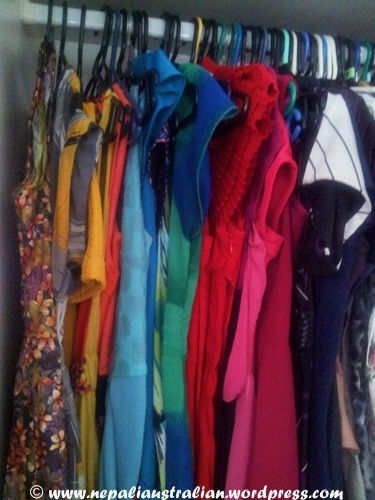 Now there are only dresses hanging in my cupboard that I will be wearing every day to work. I counted them and there are 82 dresses. I was thinking I can wear those dress to work every day and I can still go without repeating them for almost 4 months. Gee, that is really a lot. 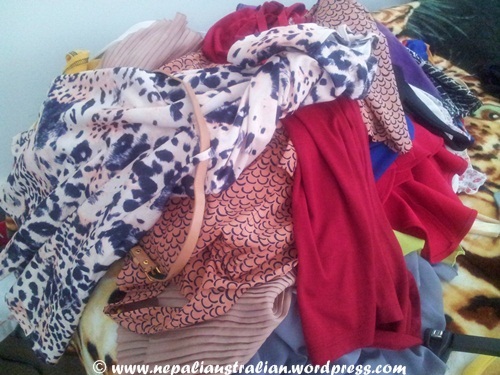 And those are dresses just for work, not counting the ones in another cupboard for weekends and parties. My mum would have a panic attack if she knew that I have more than 100 dresses along with my 100+ shoes. Can a girl ever have enough dresses and shoes? So I am planning not to buy any dress this year in Sydney. When I fly for my next trip aboard that will be my licence to shop again. Let’s see if my plan is going to work. Please let me know if you have any solution for me. I am sure I am not alone here. This entry was posted in Fashion, Personal and tagged bags, clothing, Confessions of a Shopaholic, dresses, shoes, shopping, style. Bookmark the permalink. 100 pairs? LOL Where do you keep them ? I’m not a shopaholic. I used to have sneakers that I wore for 3 years…. It’s a balancing act, and the goal is to find what works for you, where you are comfortable. Don’t be too hard on yourself. If it bothers, perhaps set a monthly personal shopping budget? That way when you buy, you won’t carry guilt for the purchase. he he he. that is truly not fair to clothes. I am happy you are thinking about controlling not to ‘stuff’ too much stuff. I totally feel you!! I have no place in my wardrobe anymore and the clothes are squeezed in that it takes a good couple of minutes to pull one hanger out without disturbing the rest. I’ve been meaning to giveaway some clothes but every now and then when I take them out I fit into everything and I just put them back in. The thing is I don’t even wear them as often, coz I don’t do much. I’ve been thinking to get a bigger wardrobe so my clothes can breathe and the funny thing is, I don’t even know how these get accumulated. I only buy shoes but the clothes in my wardrobe keep increasing. I try not to, if I make up my mind but I’m quite an impulsive shopper and like you mentioned, if a good sale is on..god forbid! Haha. The pay you have to pay to keep up with fashion. 😀 This year for Christmas, I shall put a brand new 8 door wardrobe and a rotating shoe closet on my Santa’s list and see what happens 😀 It looks like the doors on my wardrobe increase with my age!! Cheers! You must have lots of self control . I used to work in North Sydney as well and I used to go to the shoe shop so often, the one opposite Hungry Jacks. They have really great collection. That is sad.They were good.